Talking turkey. Big and bright, the Australian brush-turkey (also known as the bush or scrub turkey) is hard to miss. A colorful head tops a black body that is supported by strong legs and wide feet that are made for digging. 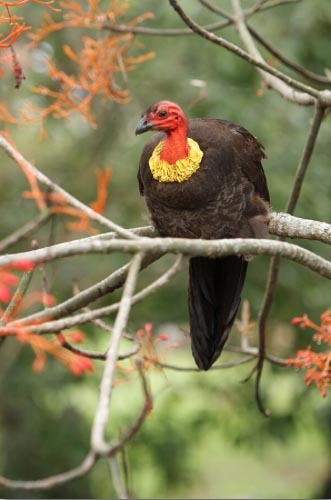 A clumsy flier, the brush-turkey cannot be airborne long distances, only taking flight when threatened by predators or to roost in trees at night and during the hottest parts of the day. Down Under showstoppers. Males weigh over 5 pounds (2,450 grams) and females are slightly smaller at about 4.8 pounds (2,210 grams). A body covered in deep, blue-black feathers is topped by a bare, red head and yellow throat wattle (birds in the northern parts of the range sport pale blue wattles). Females and younger birds have dull yellow wattles. The birds’ undersides are sprinkled with white feathers, and their tails are large, fan-like and laterally flattened. Their bill is black and hooked. Outside of the breeding season, the males’ wattle shrinks and loses some of its bright color. 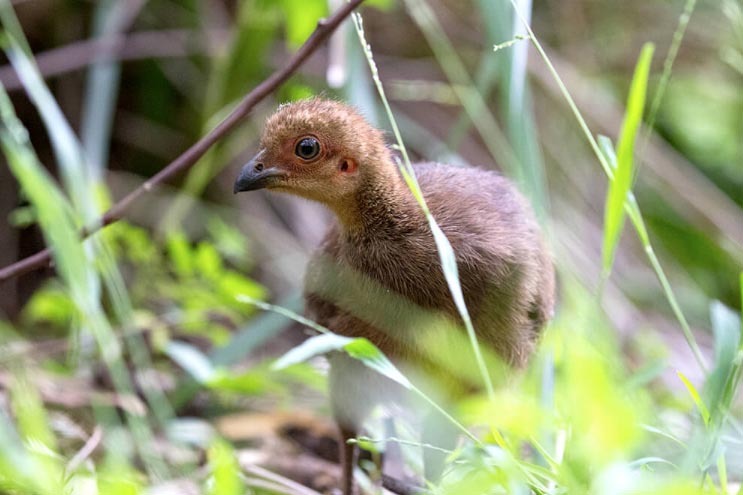 Australian brush-turkey chicks don't look much like their parents, as they're small, plump birds with dark brown feathers. They grow fast, and within a few months a chick will have the dull blue-black plumage and the characteristic upright tail. Its head and neck will have become a featherless dark pink. I want to be alone. Solitary and shy by nature, these birds will, however, spend the night in communal tree roosts. Australian brush-turkeys live in upland rain forests and in wet woodlands near coasts. They can be seen in drier scrubland farther inland. This species also frequents urban wooded areas, and have been known to take over backyard compost heaps as potential mound sites in Brisbane and Sydney, Australia. Get off my lawn! Australian brush-turkeys venturing into urban or suburban areas may run afoul of humans when trying to find a possible mound location. As they dig for leaf litter, twigs, and dirt suitable for mound building, they can make a mess of yards, gardens, and parks. They may also try to steal mulch for their mounds. They have been part of the staple diet of Aboriginal Australians. The birds’ nonhuman predators include dingoes, dogs, snakes, and goannas (a type of monitor lizard). The fragmentation of their habitat is increasingly bringing the Australian brush-turkey into areas inhabited by humans. Picking up a quick meal. Omnivorous, brush-turkeys eat insects, fallen fruit, and seeds, which they find by raking leaf litter with their feet or breaking open rotten logs. Birds of few words. Generally quiet, Australian brush-turkeys may exchange soft grunts. Males have a deep, three-note booming call. Taking the mound. When it comes to courtship, it’s a male’s wattle and building abilities that matter. The male's wattle becomes much larger during breeding season, often swinging from side to side as they run. During mating and nesting season, the males' heads and wattles also become much more vibrant in color. The Australian brush-turkey is one of the continent’s three "mound builders." After mating, the male builds a mound by gathering earth, leaves, and other ground material together with his powerful legs. The mound can be as big as 3 feet tall and 13 to 16 feet in diameter. Females choose males based at least partly on the quality of the mound. They may visit numerous mounds before selecting one. If a mound is particularly attractive, more than one female will lay her dozen eggs in a single mound! Egging them on. Those eggs are laid over the span of a few days, and females sometimes lay eggs in several different mounds to increase the changes that her offspring will survive. The heat generated through the decay of moist organic material in the mound incubates the eggs. 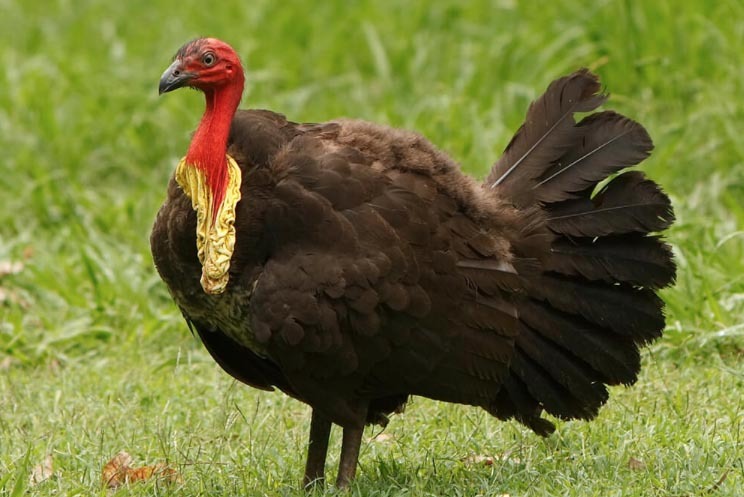 The optimum incubation temperature is approximately 91 degrees Fahrenheit (33 degrees Celsius), which the male brush turkey maintains by removing and adding layers to the mound. Once the eggs are laid, the male drives the female away and covers the eggs with the ground matter. After hatching, chicks spend the first two days of life scrambling through the mound to reach the surface. As part of the Megapodiidae family, this species’ chicks are precocial: they can fly from the time they emerge from the mound. Since brush-turkey chicks are pretty much on their own from the beginning, the chance of death is high. A bird’s chance of survival to adulthood is as little as one in 200! The nesting mounds are maintained (and defended) for almost a year by the male, as they are used by multiple females. We do not currently have Australian brush-turkeys at the San Diego Zoo or Safari Park. Bouncing back. While they are currently fairly common, the Australian brush-turkey was almost driven to extinction in the 1930s, when the Great Depression made these easy-to-hunt birds a reliable source of meat and eggs for human consumption. The birds’ habitats are becoming increasingly fragmented, which can drive them into areas populated by people, where their digging activities can cause clashes. Clutch size: up to 50 eggs in one nest, laid by several different females. Chicks in this family (Megapodidae) are the most precocial in the bird world. They kick their way out of the egg and can fly soon after emerging from the mound. In many places in Australia, brush-turkeys are totems for Aboriginal people.